Desert Island Discs: “Beat And Torn” by The Spongetones | Name-Brand Ketchup. ← A fine blog. Cromulent and embiggifying. In the life of every young’un who loves music there arrives a discernible, definable moment: when you first fall for a style of music that is NOT the type your parents played around the house. I suggest that this is an early milestone of adolescent emancipation, the necessary process of differentiating one’s personality from those of one’s parents. Like many “Boomers” of my age (God, how I hate that term), for me this cultural milestone was 1964 and the British Invasion. The British Invasion was really only a short period of time. It lasted a little longer than three years, book-ended by The Beatles performing on “The Ed Sullivan Show” in February 1964 and the release of “Sgt. Pepper” in June of 1967. But its influence continues to resonate nearly 50 years later: power pop artists continue to create enduring songs that capture the enthusiasm and energy of that time. Which brings us to The Spongetones and their album “Beat And Torn.” They intelligently revitalize and re-energize the sounds we loved, and place them in the times we now inhabit. The Spongetones are Steve Stoeckel, Pat Walters, Jamie Hoover, and Rob Thorne. They began playing bars as a covers band in Charlotte, North Carolina in the early ’80s. They signed to a regional indie label in 1982 and released their first LP, “Beat Music,” the same year. Next came an EP, “Torn Apart,” in 1984. “Beat And Torn” is a conglomeration of both discs plus a bonus track, and is as close to a perfect power pop album as I can imagine. “Power pop” is a genre of music influenced by the British Invasion. (Pete Townshend coined the phrase when asked to describe the type of music played by The Who, and it stuck.) Simply put, power pop songs are pop songs that have power. They’re straight-ahead songs traditionally structured with strong melodic lines, harmony singing, concise hook-ey and jangly guitar riffs, forceful drum beats, and lyrics about boys and girls in love. Add to the mix “power chords”: solid and crunchy rhythm guitar passages, adding a harder rock edge. Songs are usually about three minutes long, the traditional length per side of a 45-rpm single. Still another trademark of power pop is “compression,” or electronically narrowing the dynamic range or volume of the music: bringing the softer parts even in volume to match the louder parts. Eventually every musical genre gets chopped and channeled into subgenres. “Southern power pop” is broadly characterized as the power pop sound infused by “roots rock” (e.g., Elvis Presley, Buddy Holly, Link Wray, Duane Eddy, The Everly Brothers). The Spongetones developed their chops in the Charlotte music scene, and fall squarely into this tradition. Even so, many people for whom I’ve played “Beat And Torn” immediately ask if the songs are Beatles outtakes. Comparisons are sometimes drawn to The Rutles, the Beatles parody group from the late 70s led by Monty Python’s Eric Idle and Neil Innes. But “Beat And Torn” is no parody, nor an aping of the style. It’s finely-crafted performing and songwriting that stands on its own merits, even as it simultaneously owes a great debt of inspiration to all the Top 40 bands of ’64-’66. Any one of these songs would have been a hit back then. Obviously the Spongetones shade many of their songs with familiar elements of Beatles songs. So while the tunes aren’t direct re-writes they invoke a lot of, “Hey – this sounds familiar!” They get the fine details right; at any given time the background vocals of Stoeckel, Walters, and Hoover sound and blend exactly like Lennon, McCartney, and Harrison. The album kicks off with “Here I Go Again” which could have been an extra from “A Hard Day’s Night,” down to the Rickenbacker rhythm line and the Ringo-like bongos. “Better Take It Easy” opens like “Day Tripper” and carries a similar momentum. “Don’t You Know?” and “You’re The One” would have been at home on the “Help!” soundtrack album. “Eloquent Spokesman” and “Shock Therapy” are closer to the Beatles’ ’67 era sound, but may have found a home on “Revolver.” “Lana-Nana” has a great Lennon feel to it, “Annie Dear” a McCartney vibe. But this isn’t just a Beatles show. Many of the songs aren’t beholden to the Fab Four. Various songs evoke such stalwarts as Peter and Gordon (“Take My Love”), The Hollies (‘This Kiss Is Mine Tonight”), The Who (“My Girl Maryanne”), The Dave Clark Five (“Tell Me Too”), Paul Revere and the Raiders (“Cool Hearted Girl”), The Byrds (“Every Night Is A Holiday”), The Kinks (“Where Were You Last Night”), The Searchers (“Now You’re Gone”), and The Zombies (“A Part Of Me Now”). Far and away, though, my favorite song on the album is “Have You Ever Been Torn Apart?” It’s a masterpiece, a raver with great hooks and tight harmonies, and a guitar solo on the bridge that shreds. Though it evokes Lennon songs like “I’m A Loser” and “And Your Bird Can Sing,” it puts me in mind mostly of “Lies” by The Knickerbockers. Exhilarating. 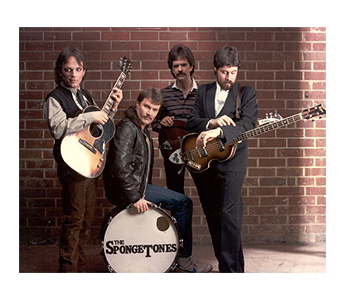 The Spongetones continue to delight fans nearly 30 years later with new CD releases, side projects, and wildly popular live shows in and around North Carolina. “Beat And Torn” will thrill any of us for whom the British Invasion was the entrée into a musical world beyond our parents’ living room. My highest possible recommendation as a Desert Island Disc.